A fantastic addition to any event, party or as a one off fun-based activity. Our series of football based challenges will test players, of all ages, as they battle to try and overcome each activity. Ronaldo- How hard can you smash it?! Test your shot speed against our speed gun. ​Ibrahimovic- Prove your deadly finishing by curling shots through targets in a goal. Kroos- Can you thread a pass through a moving target- a rolling tyre! De Bruyne- How good is your long passing? Score points for hitting targets from a distance. 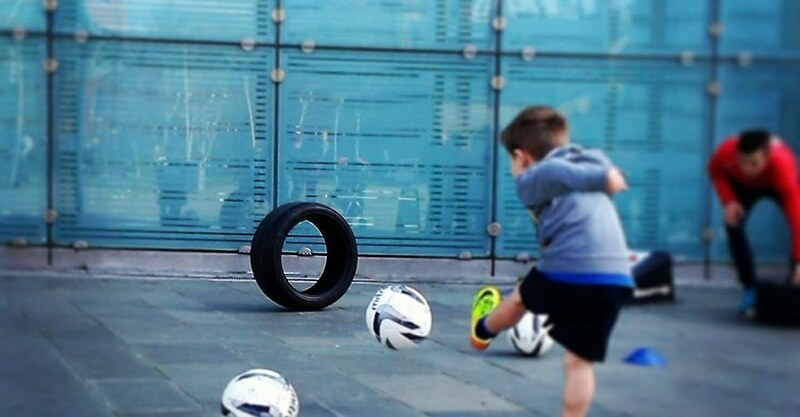 Messi- How fast can you dribble through an obstacle course-watch out for those tyres! Neymar- Control the ball from a height and play a 1-2, as fast as you can! All of the activities will be organised and delivered by LSC. This is a great way to spend a couple of hours, having fun, battling against your friends plus developing your skills and techniques along the way. The Street Football Challenge can be hired in two-hour blocks at a venue to suit you – simply get in touch to find out more. With a ‘street’ theme, our Football Challenges can be set up in a car park, tennis court, a sports hall or any safe open space – we can adapt to the space provided. The Street Football challenge can be booked for Manchester based customers only, for two-hour slots at a time that suits you and subject to our availability. Our street football challenge is managed and organised by our highly experienced and qualified coaches who will ensure your guests have an amazing time. We carry out a full safety assessment before beginning the street event and ensure that we adhere to stringent safety and quality procedures to deliver the best possible experience. Our coaches will tailor the games and challenges around your guests – factoring in ages and abilities.